The secret to this simple salad of watermelon, pea shoots, fresh basil, feta and scallions in a honey vinaigrette is a few liberal shakes of Tabasco. Well, that and a nice Sancerre. 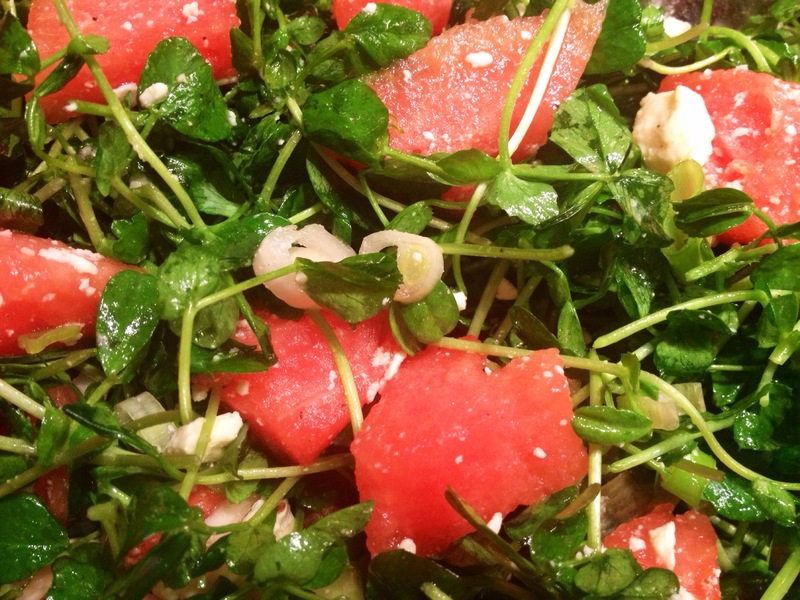 This entry was posted in salads, vegetarian and tagged feta, pea shoots, watermelon by Jasmine Nielsen. Bookmark the permalink. Since I still had half of a small watermelon to consume, I made it the next night with green leaf lettuce, which was also delicious. I mixed the Tabasco right into the dressing this time around and, oddly, thought it was better when shaken on at the end. Aren’t we allowed to use Tabasco? Do we always have to use Siracha? I should also note that I did not figure this out myself. Made the salad sans Tabasco and it lacked a little something. Quick search online tipped me off to what was missing.